Hi Caleb! Tell us how you came to apply for the Accenture Scholarship. It has always been a goal of mine to continue my music studies overseas. I’m now in my fourth year at ANAM and I think now is the right time. I applied for this scholarship to help make it possible to take the next step. Recently I have been making it a higher priority to record and make a collection of the repertoire that I work on throughout the year. This has made it a much smoother process in applying for competitions and scholarships like Accenture. When applications opened, I sent a few recordings to my teacher and conferred with him about which to use and sent one in from a recital earlier in the year. What made you choose the cello? Music was always a big part of my life, learning much from my sisters who began learning before I did. I had learnt violin for a year, and then chose the cello at age six as it would be the last piece of the puzzle to complete our sibling string quartet. I dabbled in quite a few instruments including the recorder and the organ, before finally settling on the cello and piano. The cello was always my favourite instrument because of its beauty of sound and versatility through which I had a voice to express myself the best. Tell us about your AYO experience so far. AYO National Music Camp in 2016 was my first ever experience playing in a full orchestra and it was nothing short of mind blowing. I’d never had this kind of opportunity before as we lived too far away from any youth orchestras or programs. It was so much to take in and learn all at once, but I was lucky to have an experienced and encouraging ‘deskie’ and I quickly fell in love with symphonic music. The following year I attended as many AYO programs as I was eligible for. The friendships that were formed and the music that we made together were some of the defining factors that led me to pursue music. With your experiences over the past few years in mind, what advice would you give to an aspiring young musician? Perform at every opportunity you have. The best way to become more comfortable with anything is to just do it over and over. There is no one else quite like you in the world, so believe that you have a unique story to tell and carry your audience with you through that journey. Receiving the Accenture Scholarship has brought my dream for further study another step closer to reality. I am currently planning trips to Europe to meet and play for teachers there. This will hopefully solidify exactly what that next step will look like and which schools I should apply for. The scholarship has also made it financially possible for me to tour internationally with AYO this year. The 2016 tour was an incredible experience, so I am extremely excited to see what new experiences this tour will bring. I am especially looking forward to hearing Daniel Müller-Schott perform the Shostakovich concerto! What can we expect from Caleb Wong in the years to come? At present, I am mainly focusing on developing my skills in becoming a better-rounded and complete musician. I love performing both solo and with others in orchestral and chamber music, so it would be a dream come true to eventually have a career in performance – whatever form that may take. Meet the previous recipients of the Accenture Scholarship, and find out what they're up to now! Sunga is currently completing her honours degree at Queensland Conservatorium of Music. Last year she attended the 50th Annual International Horn Symposium in America to immerse herself in all things French horn. 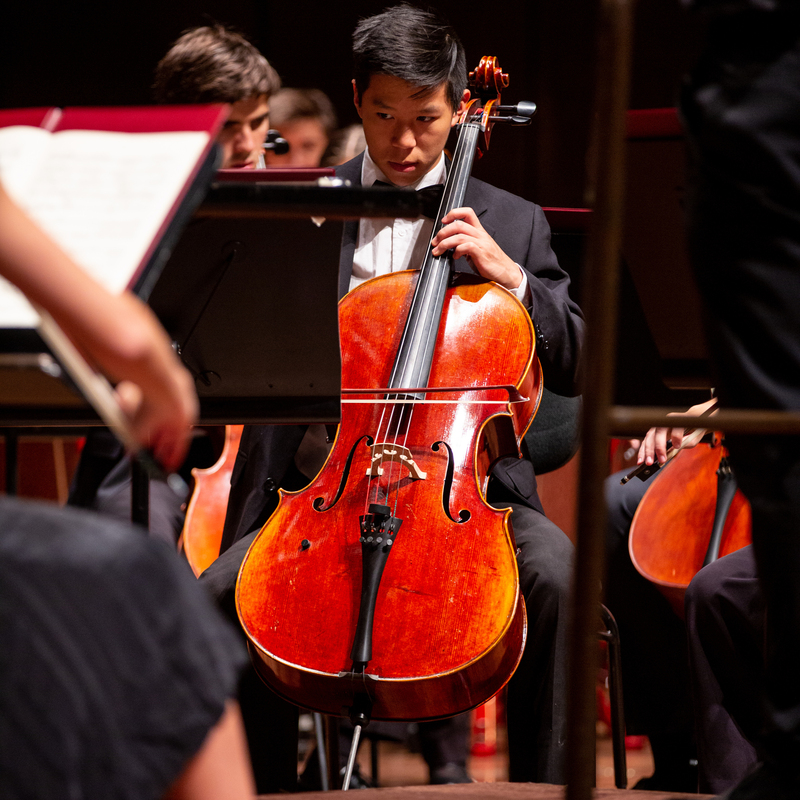 Sunga recently took part in AYO February Season, playing in the orchestra pit for Wagner’s Parsifal, and will be embarking on the AYO International Tour later this year. Jenna is currently a Trumpet Fellow in the Sydney Symphony Orchestra’s Fellowship Program. As an orchestral musician, she has played with several of Australia’s professional orchestras, and toured to Singapore as part of the Australian World Orchestra’s 2016 season as a member of their Academy Program. Jonathan is in great demand as a performer across Australia, and has just landed a permanent position with the Tasmanian Symphony Orchestra. He also enjoys chamber music, and is a founding member of the Estivo Piano Trio. Jenna is a casual bassoonist with the WA Symphony Orchestra, and a current musician at ANAM. She has also freelanced with several chamber ensembles across the country. Jenna has travelled internationally to participate in summer academies and perform in masterclasses with some of the world’s most renowned bassoonists. Jack is currently studying at the Royal Northern College of Music in Manchester, UK, and is an alumni of ANAM. He has performed extensively as a soloist, orchestral musician and chamber musician throughout Australia and overseas. Lloyd is rapidly growing a reputation as one of Australia’s finest young chamber musicians and collaborators. He has performed at numerous festivals around the country, including the Melbourne, Perth and Sydney Festivals; and as an orchestral musician and soloist with many of Australia’s professional orchestras. Joel has played as percussionist with the Tasmanian Symphony Orchestra, Melbourne Symphony Orchestra and SSO Sinfonia. More recently he has turned his attention towards conducting, and has won a place on the 2018 Australian Conducting Academy Summer School. Liisa has been a member of the Australian Chamber Orchestra since 2015. She also has vast experience as a chamber musician, having performed at Australia’s major arts festivals, and overseas at Thy Chamber Music Festival in Denmark. Brigid now lives in New York and works as a chamber and solo musician. She performs regularly with the Merz Trio, a piano trio based in New York, and has given performances at major international concert venues such as Wigmore Hall, the Purcell Room and the Royal Albert Hall. Rosie is the Associate Principal Trumpet of Orchestra Victoria, and has performed with several of the country’s leading orchestras, as well as ensembles from overseas including the Macau Orchestra and the Seoul Philharmonic Orchestra. We’ve been lucky enough to welcome Rosie back to AYO as a trumpet tutor at AYO National Music Camp.